39,000+ DACA got green cards, 1,000+ DACA got citizenship, already. Thread: 39,000+ DACA got green cards, 1,000+ DACA got citizenship, already. The last sentence is the most important info in the article. Over the weekend, Trump offered Republicans and Democrats a plan to give amnesty in the form of three-year work permits to a little more than 700,000 illegal aliens who are enrolled in the President Obama-created Deferred Action for Childhood Arrivals (DACA) program. The deal gives the roughly 325,000 foreign nationals living in the U.S. on Temporary Protected Status (TPS) amnesty to remain in the country as well. In return, about a fifth of border wall funding — $5.7 billion — would be secured to build a barrier at the U.S.-Mexico border. Trump’s offer is nearly the identical immigration deal that the U.S. Chamber of Commerce lobbied the administration to push. In a letter to Congress and Trump weeks ago, Chamber of Commerce executives asked the White House to craft and promote a deal that extended Obama’s executive amnesty and gave TPS beneficiaries amnesty. “The Chamber supports a deal that combines increasing border security with protection and legal status for Dreamers and long-term beneficiaries of the TPS program,” a Chamber of Commerce executive wrote. U.S. Chamber of Commerce executives are urging Congress and Trump to end the government shutdown by giving amnesty to illegal aliens. For the past year, some of the biggest donors to the Republican Party — including the multinational corporation AT&T and Steve Schwarzman of the Blackstone Group — have demanded amnesty for DACA illegal aliens. While the donor class supports Trump’s offer — which was crafted by Sen. Lindsey Graham (R-SC), White House adviser Jared Kushner, and Vice President Mike Pence — his base of supporters is less enthusiastic. Kaus said Trump’s offer codifies Obama’s DACA program, which he says will nullify all legal arguments against the executive amnesty. 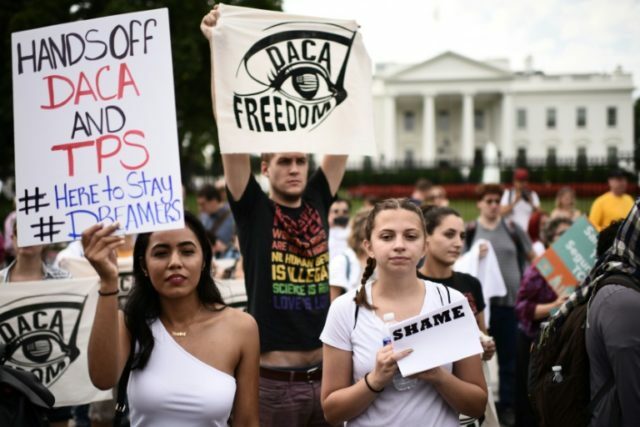 Additionally, Kaus tells Breitbart News the temporary three-year work permit for DACA illegal aliens will soon become a permanent fixture of immigration policy. “I think it was a mistake for Trump to bring any kind of amnesty into the wall deal at all,” Kaus continued. Co-host of the “Red Pilled America” podcast Patrick Courrielche told Breitbart News that while amnesty would be a boon to DACA illegal aliens, it would hurt the very Americans who supported Trump. A DACA amnesty would put more U.S.-born children of illegal aliens — commonly known as “anchor babies” — on federal welfare, as Breitbart News reported, while American taxpayers would be left with a $26 billion bill. Since DACA’s inception, more than 2,100 DACA recipients saw their protected status revoked for being involved in gang activity or suspected/convicted of a felony. Due to a hidden gateway in the DACA program, more than 39,000 illegal aliens have been able to obtain Green Cards and more than 1,000 naturalized. Excellent point. How can Trump continue to support a program that his former head of DOJ, Jeff Sessions, has declared to be unconstitutional? If Trump were to sign the 3-year extension into law, the administration would no longer have a leg to stand on, which means there would be no reason for the U.S. Supreme Court to hear the case. If that were to happen, the SCOTUS could reject the case and let the lower courts ruling stand. I'm no legal beagle, but I think Kaus is right on this. Beezer, hattiecat and stoptheinvaders like this. DACA illegal aliens will never accept amnesty for themselves. It will include the broader community of dreamers, parents, other family members. Then we add in all of the anchor babies born because we refused to enforce immigration laws and offered sweeping amnesty. If the president allows "Advanced Parole" to resume which they are trying for now, they can leave the country and return legally to gain possible citizenship. This is true for TPS individuals presently. Thry can use "Advanced Parole". So many loopholes. Last edited by GeorgiaPeach; 01-22-2019 at 12:29 AM. Beezer, hattiecat and MW like this. Every DACA that gets a green card can apply for citizenship after 5 years. As new citizens they can sponsor their relatives for green cards. I want them all deported and the ones pouring over our border every single minute of every day for the last 5 decades! What is wrong with these people, we owe you nothing, go home and mouth off and fix your own country. They are an unwanted pest, we do not want law breakers on our soil, who jump in line in front of those coming here legally! Go jump in line in front of everybody at Disneyland and see what happens! We do not like it, we are vehemently against this! Judy, stoptheinvaders and MW like this. All about immigration: Green cards? Citizenship? All about immigration: Green cards? Citizenship? Illegal Aliens?